Download "TITLE 29: EMERGENCY SERVICES, DISASTERS, AND CIVIL DEFENSE CHAPTER I: EMERGENCY MANAGEMENT AGENCY SUBCHAPTER d: STATE EMERGENCY RESPONSE"
3 (January 1, 2014). "IEMA" means the Illinois Emergency Management Agency. "Incident" means a release that occurs intentionally, for example, as a result of sabotage or a permit violation, or intentionally disposing of hazardous materials in violation of federal or State statutes. "Local Emergency Response Agency" means police, fire, civil defense or any other local government agency or department charged with the responsibility of responding to an accident involving a hazardous material or extremely hazardous substance. "Local Emergency Planning Committee" or "LEPC" means the committee appointed by the SERC, in accordance with section 301(c) of SARA. "Oil" means oil of any kind or in any form, including, but not limited to, petroleum, fuel oil, sludge, oil refuse, oil mixed with wastes other than dredged spoil, and generally including, and of a large class of, oily, combustible substances that are liquid, or easily liquifiable on warming, and soluble in ether, but not in water. "Release" means any spilling, leaking, pumping, pouring, emitting, emptying, discharging, injecting, escaping, leaching, dumping or disposing into the environment (including the abandonment or discharge of barrels, containers and other closed receptacles). 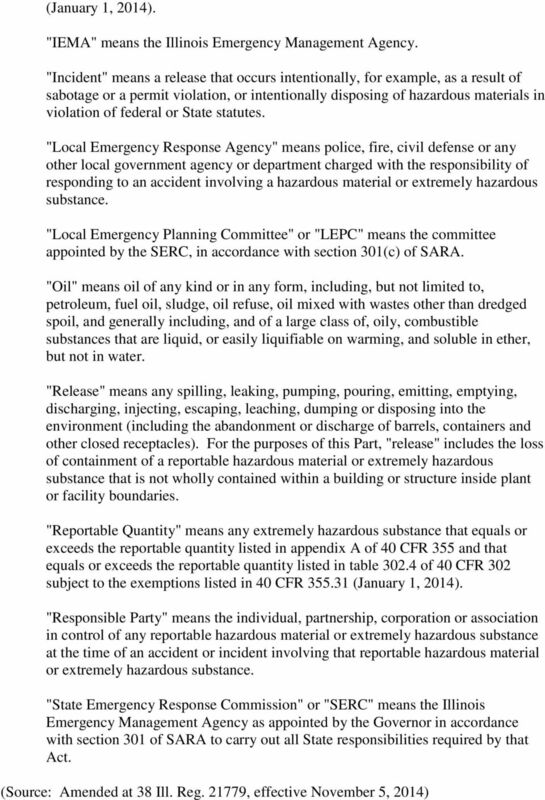 For the purposes of this Part, "release" includes the loss of containment of a reportable hazardous material or extremely hazardous substance that is not wholly contained within a building or structure inside plant or facility boundaries. 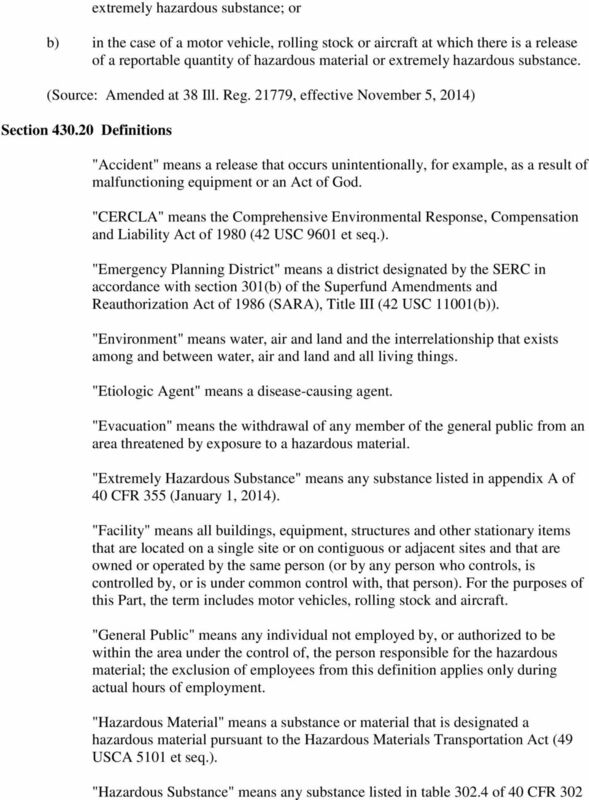 "Reportable Quantity" means any extremely hazardous substance that equals or exceeds the reportable quantity listed in appendix A of 40 CFR 355 and that equals or exceeds the reportable quantity listed in table of 40 CFR 302 subject to the exemptions listed in 40 CFR (January 1, 2014). "Responsible Party" means the individual, partnership, corporation or association in control of any reportable hazardous material or extremely hazardous substance at the time of an accident or incident involving that reportable hazardous material or extremely hazardous substance. 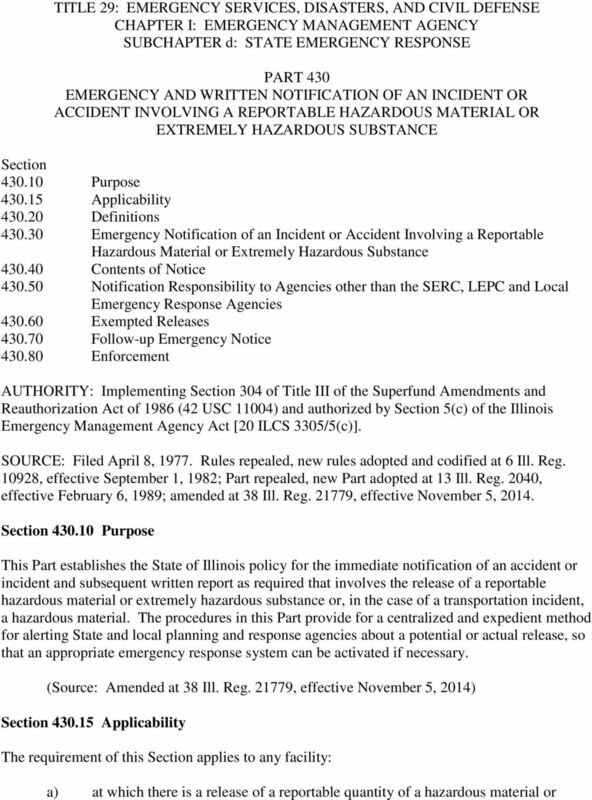 "State Emergency Response Commission" or "SERC" means the Illinois Emergency Management Agency as appointed by the Governor in accordance with section 301 of SARA to carry out all State responsibilities required by that Act. 6 Department of State Police, Illinois Department of Agriculture or Illinois Department of Public Health. It shall be the responsibility of the SERC to notify State agencies having jurisdiction pursuant to SERC Standard Operating Procedures. 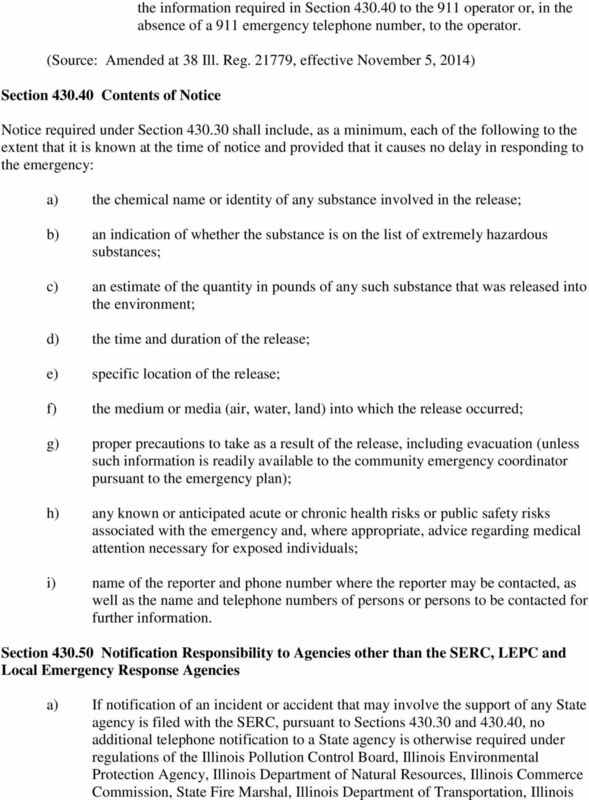 b) Notification to the SERC or the LEPC does not satisfy any requirements to provide telephone notification of a hazardous material incident or accident to federal or local emergency agencies. c) Notification to the SERC or the LEPC does not satisfy additional requirements to provide subsequent written notification, reports or other data as may be required by law, rule, regulation, license or permit. 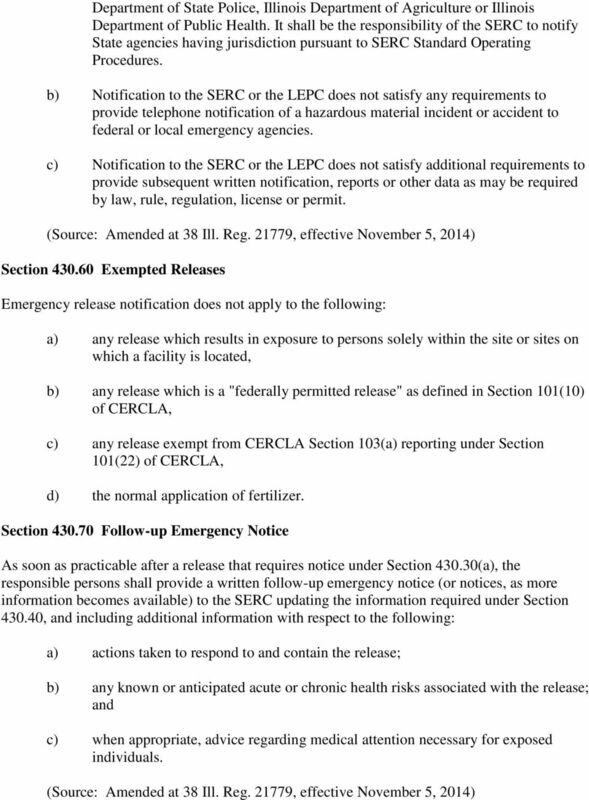 Section Exempted Releases Emergency release notification does not apply to the following: a) any release which results in exposure to persons solely within the site or sites on which a facility is located, b) any release which is a "federally permitted release" as defined in Section 101(10) of CERCLA, c) any release exempt from CERCLA Section 103(a) reporting under Section 101(22) of CERCLA, d) the normal application of fertilizer. Section Follow-up Emergency Notice As soon as practicable after a release that requires notice under Section (a), the responsible persons shall provide a written follow-up emergency notice (or notices, as more information becomes available) to the SERC updating the information required under Section , and including additional information with respect to the following: a) actions taken to respond to and contain the release; b) any known or anticipated acute or chronic health risks associated with the release; and c) when appropriate, advice regarding medical attention necessary for exposed individuals. 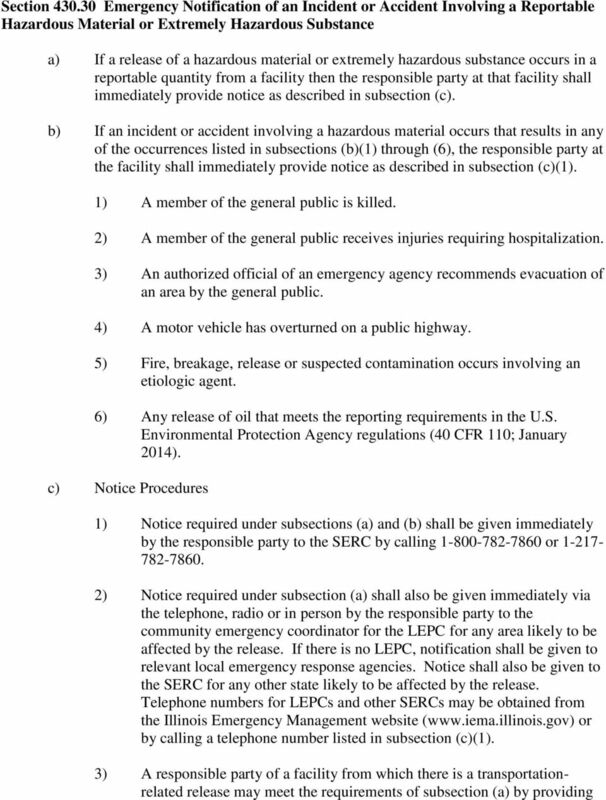 7 Section Enforcement The SERC shall have authority to investigate any violation of Sections , , and Any enforcement or civil action required under this Part shall be carried out pursuant to SARA and the Illinois Emergency Management Agency Act and this Part. CONTRACTOR ENVIRONMENTAL LIABILITY 101. Violation of environmental laws may result in fine or imprisonment or both. SOLVENT CLEANER MSDS Page 1 of 5 SAFETY DATA SHEET. (To comply with OSHA s Hazard Communication Standard 29CFR 1910.1200/ANSI z400. "FALSE ALARM BYLAW 1994 NO. 4786"